As Henry gets older I am really starting to enjoy all the things we are able to do together now. I love to bake and I'm hoping Henry will also share that love with me. Henry has always been fascinated with me cooking in the kitchen. When he was an infant I would sit him in his high chair and do a cooking show for him each night as I made dinner. 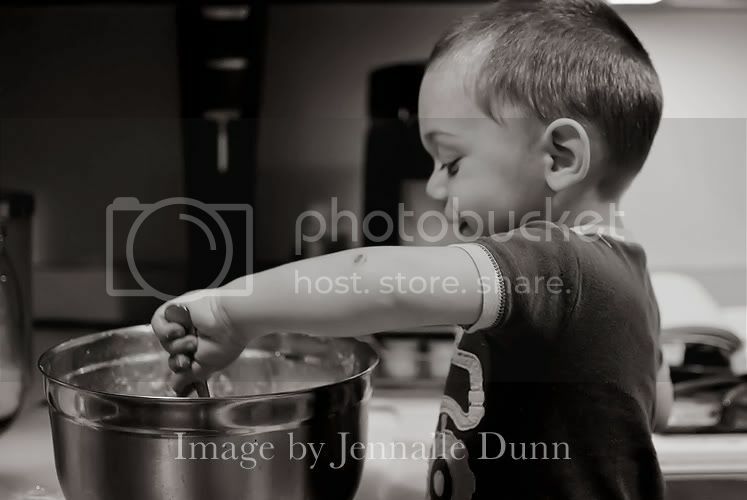 Now that he is almost two I thought it was time for me to start letting him help out a little in kitchen and get involved. Up until now though I hadn't found a recipe or food that I thought was a good introduction. I had picked up some vegan cookbooks at our weekly trip to the library and saw a banana muffin recipe that sounded delicious. We found out Henry is lactose intolerant (That blog post is coming soon) so in an effort to broaden my culinary skills I figure vegan cookbooks were the best route to go since I know there will be no dairy in those recipes. While I was thumbing through the cookbook it dawned on me that a vegan muffin or cookie wouldn't have any eggs in it either thus making it the perfect batter for Henry to play with. Henry had so much fun pouring all the ingredients in and mixing it all together. 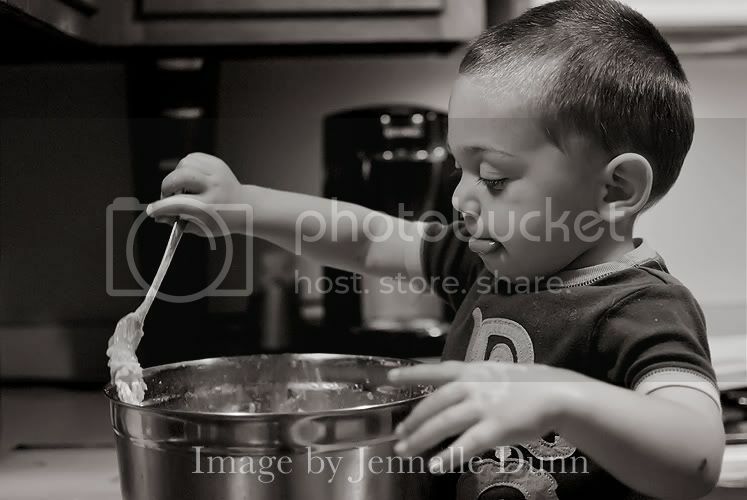 I enjoyed not having to worry about him tasting the batter or ingredients. I wanted to amp up the banana muffins with some blueberries and well lets just say it all went downhill from there. Henry didn't agree with me that blueberries would taste oh so good in the muffins and stirring turned into flinging which ended up with a little time out session. Meltdown 2 happened when the stirring was over. Apparantly pouring batter into muffin pans is traumatic for an almost two year old. So I popped the muffins into the oven and attempted to rectify the toddler situation. Over an hour later Henry was happy and fine but my poor muffins were not. I had completely forgotten to set the timer and then just flat out forgot I put muffins in the oven. I actual thought my neighbor was cooking something on the grill because there was this faint burning smell and it was then that I realized what I had done or forgotten to do. So unfortunately I can't share my Banana Blueberry Muffin Recipe because I never got to try them. However I can share some pictures of Henry's first time baking. I'm hoping to retry this muffin recipe soon and I'll be sure to share the recipe and finished product with all of you.